It’s a dark and stormy night, but the wind and rain can’t bring you down as long as you’re safe inside your comfortable home. Then the power goes out and everything changes. If you have a working standby generator, all it takes is a quick flip of the switch to turn the power back on. However, if your generator is in disrepair, you could be stuck scrambling in the dark for candles and matches. Avoid the panic of Scenario B by contacting the expert team at Chesapeake Electric. Our highly skilled technicians have the knowledge and experience to keep your standby generator in perfect working order all year round. Our locally-owned and operated company is a licensed and insured electrical contractor and a leading provider of standby generators and generator maintenance in Annapolis, so you can count on us for the absolute best possible services. We take a great deal of pride in the quality of our work, and we always maintain the highest of standards to ensure that you have electricity no matter how severe the weather. Keeping your standby generator in peak condition is our main priority at Chesapeake Electric. We provide routine standby generator maintenance by factory-trained technicians to help catch minor issues and prevent them from becoming major problems, saving you a lot of time, money, and hassle in the long run. We know that some standby generators are used more often than others, which is why we offer a variety of annual or semi-annual generator service contracts to suit your needs. Using the latest technology, we can monitor your generator remotely to determine whether it needs maintenance outside of the annual service contract. Our technicians can also perform warranty service and maintenance, so if a part breaks down and it falls under the generator brand’s 5 year warranty, we can fulfill the maintenance work in no time at all. Though there may be a lot of generator repair companies out there, not all of them are created equal. 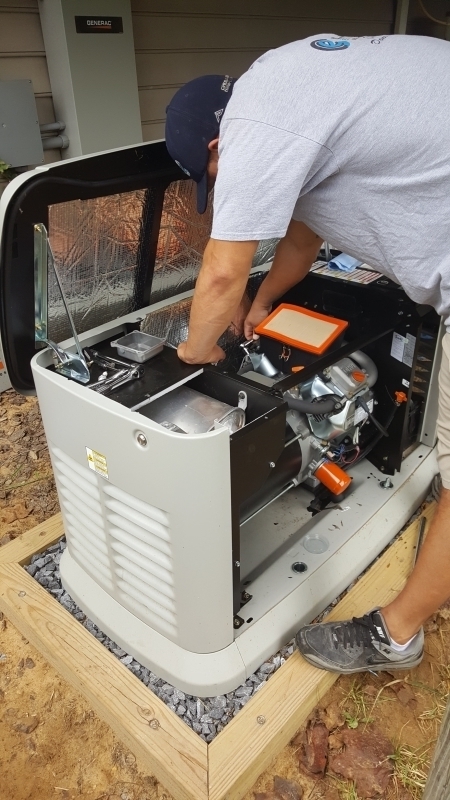 Certain products, like Generac air cooled standby generators, require technicians to undergo specific training in order to uphold warranty programs and guarantee factory-quality results. Fortunately, Chesapeake Electric has stepped up to the plate, completing all necessary training courses to provide professional repairs on leading brands like Generac, Siemens, and Honeywell. In order to ensure that your standby generator is installed and serviced properly, trust in the expertise of the outstanding team at Chesapeake Electric. With over 10 years of experience, 24 hour emergency services, and a complete dedication to customer satisfaction, no other company provides better generator maintenance services. Our friendly team is always happy to answer your questions and address your concerns, so contact us at (410)280-3388 today! To find out more information, call (410)280-3388 for a free estimate!